You are currently browsing the The Pet Product Guru blog archives for the day Monday, January 28th, 2019. This question came up because I heard of a person contacting Ringworm from his cat. He has lots of cats and sometimes it can be difficult to detect which cat is the culprit. Vetstreet.com has provided us with some insight to this situation. Ringworm appears as a red circle like rash. Although it can be itchy and irritating, it is not serious and can be easily treated. Ringworm is not actually a worm but a fungus. 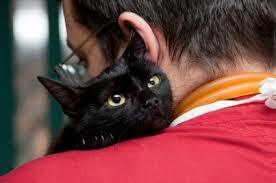 While dogs, cats and many other animals can get ringworm, cats are more likely to pick it up than other pets. To prevent the fungus from spreading, promptly take your pet to the veterinarian for diagnosis, treatment and a strategy to prevent a repeat infection. Ringworm can certainly be ugly and itchy, but it’s usually not hard to cure in people or animals, and is typically treated with cream and pills. The best oldies on the best station! Edgewater Gold Radio is your place for the best variety of oldies anywhere. Tell Alexa to “play Edgewater Gold Radio.” or download the free Edgewater Gold Radio app. Listen from our website: Edgewatergoldradio.com. add comment Comments Off on Can Pets Spread Ringworm?